A police source says the man shot dead after attempting to steal a soldier’s gun at Paris Orly Airport was a “radicalised Muslim” known to security services. The 40-year-old shot at police officers manning a checkpoint in northern Paris before launching the airport attack, the French interior minister said. Terrorism prosecutors have opened and investigation into the assault, which comes after a series of Isis-inspired attacks across France. The first shooting came at around 7am local time (6am GMT) in Stains, when a man was stopped by police at a security checkpoint. “It turned bad and the individual shot at the officers before fleeing,” a police source told Reuters. The car stopped in Stains was a Renault Clio, which was later abandoned for a Citroen Picasso hijacked at gunpoint. The car was found at Orly airport. He attempted to steal the gun from a female soldier on a counter-terror patrol before being killed, a spokesperson for the interior ministry said. No one else was injured in the incident at 8.30am local time (7.30am GMT), which triggered a red alert sent locally via the French government’s Saip terror warning system. “We were waiting in line to check in for a flight to Tel Aviv when we heard three or four gunshots nearby,” 54-year-old Franck Lecam told AFP. “There were police, emergency services, soldiers running in all directions. The airport was evacuated as security operations continued, with France’s national police urging people not to cross the security perimeter. Bomb squads and armed police were sent into the building to sweep for explosives. A notice was posted on the Paris airports authority website urging passengers not to travel to Orly, with diversions and delays expected. 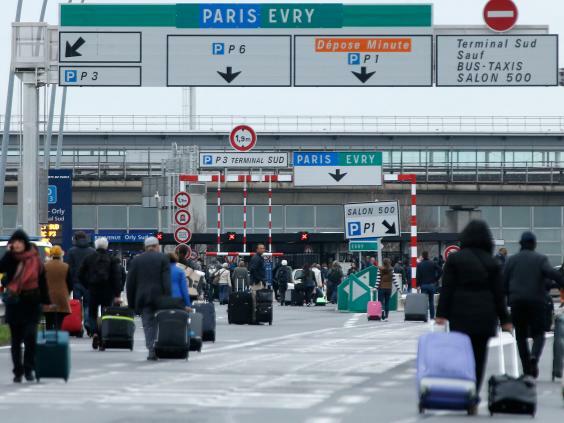 Air traffic was suspended at Orly airport’s south and west terminals as operations continued. The attacked soldier was part of Operation Sentinel – a security initiative seeing troops deployed in combat uniforms around high profile sites including the Eiffel Tower since the Charlie Hebdo massacre. France remains on high alert following a string of terror attacks directed and inspired by Isis, which has directed its followers to carry out opportunistic attacks on security forces and civilians in Europe.